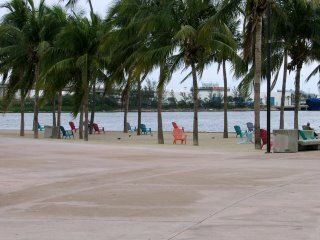 A very tranquil shot of Bayfront Park, in Downtown Miami, just down from Bayside Marketplace. In the middle of the very busy city, this spot just whisks you away to peace and calm of the bay. (If you click on the link above, this spot is in the grove of trees immediately to the left of the round bayside fountain). that's a wonderful "park" , the landscape is beautiful done! I stayed here 3 yars ago. Cool place! Daniel can you help me? I stayed in Miami 3 years ago in South Beach Miami district. I don't remember the name of Discotheque where i stayed ... it's near Mango's Tropical Cafe (900 Ocean Drive). It's an R&B Discotheque ... you know? Calm, restorative places in the midst of hectic activity - ah, feels good to be there! Thanks for showing your city.